My father was born in Nigeria. He worked hard and was fortunate enough to be awarded a scholarship to travel to the United States for his college education. He met my mother… and the rest is history. I am my father’s daughter. I have two daughters of my own, both deeply embedded in American culture and way of life but, nonetheless, Nigerian. They get little lessons about Nigeria, Igbo culture, family, and traditions and I am eager for them to experience Nigeria firsthand. It was an experience I was fortunate to have, travelling there frequently and living there for a couple of years as a child attending AIS – the American International School. I am better for that experience. It shaped who I became as an adult. It is an experience that becomes challenging to reconcile as I follow the campaign to rescue 200 girls kidnapped by terrorists. For the last week or so, I’ve spent time ruminating about our ability to change the world if we just change the questions that we ask. The theory is that a single question could connect our work to our ability to bring out the best in each other. What’s happening in Nigeria could not be further from our best. Furthermore, it is only a recent terrorist act against girls and humanity. There have been countless terrorist acts. What is the right question? What question might we ask to bring out the best in each other and ensure that young girls everywhere – Nigeria and around the world – can safely educate and build flourishing lives for themselves? Globally, we must embrace the values of social justice, respect, integrity, equality, creativity, and courage. We must acknowledge our realities, collaborate for change, empower ourselves and each other, engage in socially responsible action, call for justice, and build individual lives and a global community that truly flourishes. WANT TO KNOW MORE? 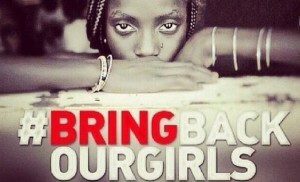 FOLLOW THE MOVEMENT TO #BRINGBACKOURGIRLS! ← Safe Today. Healthy Tomorrow.